Bringing the University to You: A Century of Service to the Granite State, an exhibition commemorating Cooperative Extension’s 100th year. “Jon Imber’s Left Hand” by Richard Kane, Documentary Filmmaker and Director of Photography : A document of this artist’s courageous and sometimes darkly humorous response to a death sentence, a diagnosis of ALS. The film traces his life, his career and his adaptations, switching from painting with his right hand to his left, and then to both hands held at his waist as the degenerative condition progresses. Adversity only makes him more determined to paint, and paint he does: more than 100 portraits in a four-month span. The Hamel Center for Undergraduate Research marks the academic homecoming of international research students with the International Undergraduate Research Symposium, brief illustrated research presentations featuring the work of IROP and SURF abroad grant recipients crafted for a general audience of faculty, students, administrators, supporters, families, and invited guests. Art DiMambro – Born and raised in Dover, New Hampshire, Arthur DiMambro began painting in the 1950’s. Throughout his distinguished career as an orthopedic surgeon, painting was his ongoing creative outlet. Since his retirement in 1991, he has been a full-time artist, developing a strong reputation for his paintings with bold compositions and unusual viewpoints. His intuitive still life compositions and his interpretations of the land and sea, while based on real objects and places, often teeter on the edge of abstraction. Arthur is a member of the New Hampshire Art Association, and won the Rosmund deKalb Award in 1975 and 1984. In the artist’s words – Experimenting with abstraction in figurative landscapes, I am struggling to find a personal, visual language in these paintings. The New England landscape is interpreted with saturated hues and shapes that break away from the context of the image. I am interested in translating what I see and how I feel into complex, two-dimensional representations, each with a life of its own. Join us for a Homecoming Tapas Hour hosted by The University Honors Program, The Hamel Center for Undergraduate Research (UROP & IROP) and The Center for International Education/IA Dual Major. Check out the exhibits while enjoying sangria and tapas! All ages are welcome. Click here for details and to register. Bonfire and BBQ along with live entertainment before the fireworks. Starting off this season with a hilarious comedy of two sets of twins whose identities are mistaken. What would you do if, while visiting a strange city, a beautiful woman mistakes you for her husband, feeds you, loves you, and won’t take no for an answer? Playing with themes of Commedia and Corsets you are sure to enjoy this wild ride as everyone tries to figure out who is who and which way is up! Tyler Paterson, Sarah Shockey, and Tim Dunn make up Shock T’s. They have been performing as a comedy band for the past four years and currently reside in Chicago where they perform at various comedy and music venues. 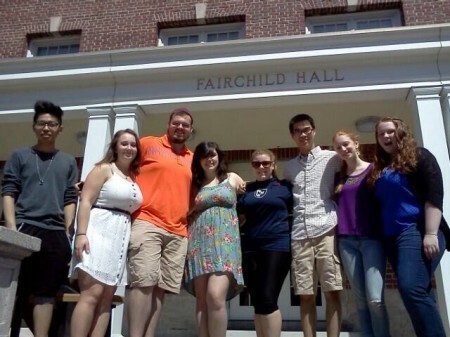 Opening act will be UNH’s Improv Anonymous. Join the 6th annual UNH Outdoor Education Program T’oe’D Talks (putting outdoor education into TED talks). These talks invite leading thinkers, researchers, and students to present short (10 minute) workshops on new ideas in outdoor education. Over 100 students and alumni attend each year, it is a great way to begin Homecoming Weekend. This event is open to the UNH community. Please join us! If you are in town on Friday night, meet up with fellow Wildcats at Martingale Wharf any time after 8pm. 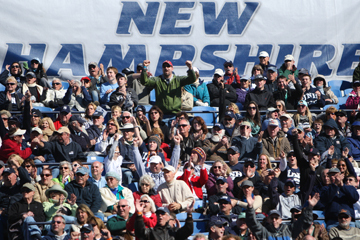 Don’t forget to wear your UNH gear! Note: This is not a formal event, private space is not reserved so space may be limited depending on when you arrive. If you are in town on Friday night, meet up with fellow Wildcats at the Thirsty Moose in Portsmouth any time after 8:30pm. 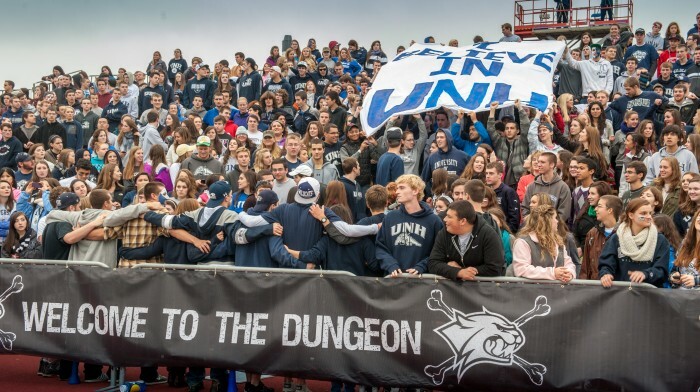 Don’t forget to wear your UNH gear! Note: This is not a formal event, private space is not reserved so space may be limited depending on when you arrive. If you are in town on Friday night, stop by Libby’s to reminisce about your four years at UNH with current students and fellow alumni! Note: This is not a formal event, private space is not reserved so space may be limited depending on when you arrive. Transportation will be provided between Portsmouth and Durham via charter bus. Free T-Shirt to the first 300 registered! The brothers and sisters of UNH Greek Life would like to invite you to our annual pancake breakfast. Join us for fresh pancakes made to order! Proceeds will support student scholarships. We can’t wait to see you! Go Wildcats! For more info, contact Erin Courville at erin.courville@unh.edu. This is an opportunity to reconnect and reminisce with old classmates, UNH staff and administrators. Updates from the current Connect Program Coordinator, Anna Metzger followed by a keynote address. The Connect Alumni Reunion Committee will formally introduce the new Connect Alumni Mentoring Program. In 1919, the UNH Band took the field at a football game for the first time. This fall, we’re celebrating 95 years of the Wildcat Marching Band and cordially invite you and your family to celebrate with us at an alumni brunch on Saturday, October 11th. $25 per adult, $10 per child 12 and under if registered by September 15. $30 per adult, $15 per child under 12 until October 6. Register here. Kickoff is at 3:30 p.m. in Cowell Stadium. The annual alumni band will be taking the field as usual, with rehearsal starting at 12:00 p.m. See the registration form to sign up! CAB would like to welcome you back to campus to meet current Cabbies and catch up with other CAB graduates. This is always an excellent time to meet up with old friends and reconnect with UNH. We are always proud to have you back and we are looking forward to the 2014 reunion! The Office of Student Involvement and Leadership is generously bringing UNH Catering, so come hungry! Visit the bookstore for gifts, books and dorm room essentials. Snacks are also available. Follow the flag to the CEPS Alumni Society tent! Catch up with fellow CEPS alumni, faculty, and staff before the game while enjoying hamburgers, hotdogs, and a free raffle. Be sure to check out the CEPS student organization displays! Festivities will include live music by Dusty Gray Band, free BBQ from Chill Catering, fun and games featuring corn hole, mechanical bull, giant Jenga, Plinko, bungee trampoline and zip line. Plenty of UNH giveaways! Free for students with game ticket. Join in the Wildcat Pride at Homecoming! See the Fan Fest poster. Join us in the newly renovated WUNH station on the first floor of the MUB for lunch, catch up with old friends, and meet some of the new DJs at the station. We hope to see you there! Jon Imber: Human Interest presents portraits by an acclaimed Massachusetts and Maine-based painter completed in the years before and in the months after his 2012 diagnosis with amyotrophic lateral sclerosis (ALS) commonly referred to as Lou Gehrig’s Disease. The portraits, painted with Imber’s commanding expressive gestures, intimately record his time with friends and family, displaying physical traces of likeness informed by memories, history, mythology, and the artist’s self-awareness. Tickets can be purchased through Ticketmaster. Option to PRE-PURCHASE tailgating spot on Boulder Field. Take a campus tour with an Admissions Tour Guide. Some highlights on the tour will be the Connect Office and Diversity Support Coalition Office. $20 per person including snacks and drink tickets. $10 per person includes one drink ticket. Private event until 9pm when public is welcome. Limited quantity available for pre-purchase so reserve early. Venue has limited capacity so depending on when you arrive, there may be a wait to get in. The closer to 9pm you arrive, the better chance of getting in quickly. Don’t forget the outdoor patio, too!